Art 5 for Young Catholics: The Rosary in Art (Softcover) - Now with the Luminous Mysteries! Art appreciation book by Seton Press. This is a book written to enhance the understanding and appreciation of the Catholic principles that went into the techniques of religious art. The theme of the book is the "Mysteries of the Rosary," as beautifully depicted by the world's greatest artists. In a showcase of fine art, the student will be exposed to the development of style from Greek to Baroque to Florentine, and other classical schools. Description of technique, scene, and color accompanies each picture, with a special emphasis on religious symbolism. Some contain brief yet profound meditations. A feast for the eyes and the soul! Glossy pages. Contains an appendix of short biographies about the artists, and an index of terms. Full color. 2006 copyright. 8.5 x 11 inches. Soft cover. 145 pp. 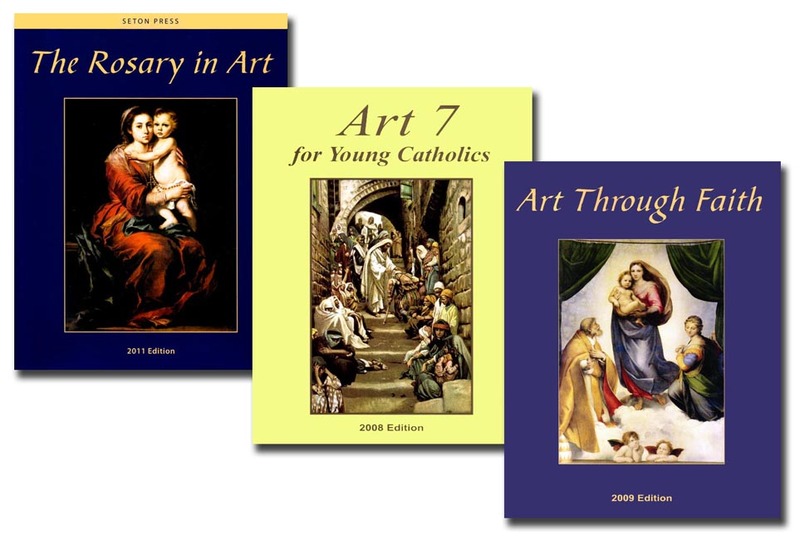 ART 7 for Young Catholics (Soft cover only) - Art appreciation book from Seton Press. Selections of painstakingly accurate New Testament scenes by James Tissot, a renowned Victorian artist. Inspired by the visions of Bl. Anne Catherine Emmerich (Mel Gibson's inspiration for The Passion of Christ), each picture accompanied by commentary and meditations written by the Catholic artist. Seton has selected the best of both his Old and New Testament renditions to introduce his fine art to a new generation. Parents, as well as students, will enjoy this book! Over 100 full color images of religious paintings. 2008 copyright. 8.5 x 11 inches. Soft cover. 109 pp. Printed on glossy, high quality enamel paper for the best possible reproduction. Includes artist biographies, glossary and index. 2009 copyright. Soft cover. 236 pp.